Conn Hudson does not like to make trades. But sometimes a trade is called for and he has to set aside his loyalty to an individual player and do what's best for the club. That's what happened yesterday, when the Nevada Dusters traded utility infielder Johnny Schaive to Cincinnati for minor league catcher Don Pavletich. "Johnny just wasn't going to get much playing time this year," said Hudson. "Not with Maury Wills, Jerry Adair, Ken Hubbs and, if need be, Tom Tresh, in the middle infield. And Hector [Lopez] can relieve Clete Boyer at third. Cincinnati needs infielders, and I'm pretty sure he'll be on the Reds card a good deal of the time." 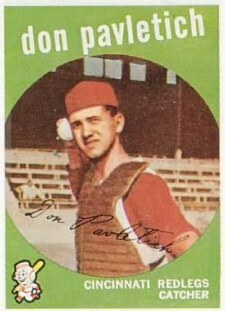 Pavletich, a right-handed hitter from Milwaukee, has good fielding skills and a superior arm. He seldom makes a mistake and has been throwing out basestealers at a pretty good clip in the minors. His hitting is still very much a work-in-progress. There was more to it. Acquiring Pavletich freed Hudson to trade another minor league catcher, Walt Hriniak, to Baltimore for an outfielder named Paul Blair. 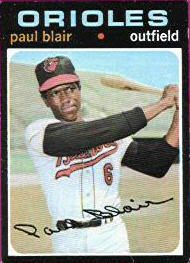 As a high school senior in '62, Blair hit .430 with eight home runs, twenty RBI, and a .680 slugging percentage. "We'd considered picking Blair up in the minor league draft," explained Hudson, "but the Orioles got him first. We weren't satisfied with Walt's progress, and they weren't satisfied with Blair's. So we cut the deal." And there was another reason for the trade -- it opened up a spot in the 25-man roster, which allowed the Dusters to summon Tony Oliva from Bakersfield. Oliva got seventeen at-bats with the Dusters last September, and impressed the powers-that-be. This year with the Bullets he's been hitting .404 with four homers and sixteen RBI. Don't look for Hudson to pull the trigger on many more trades. "We're fairly happy with our depth at nearly every position at every level," he said. DL: Jim Bouton (sp), pulled groin, 8 days. Phil Niekro (1-2) got his fourth start against the rookie Joe Watts (1-1) as Ben Naylor shuffled the lineup -- Maye to center, Williams to right, Lopez in left, and Tresh to shortstop -- to give Maury Wills a day off. The Reds came in with outfielders Frank Robinson and Tommy Harper on the DL for the duration. Niekro kept the Cincinnati batters mystified until the 6th inning, when the Reds played small ball to scratch out a run. The Dusters played long ball, with Clete Boyer hitting a two-run homer and Tresh a solo homer in the 4th before setting a number of franchise records in the 8th. Tresh hit a three-run shot to right, Jerry Adair and Vic Power followed with solo roundtrippers, and, with the bases loaded, Boyer made the most of his second at-bat of the inning by driving a grand slam to right. It was the first time the Dusters had scored ten runs in a single inning, and the first time four players had homered in the same frame. The Reds went quietly in the top of the 9th and Niekro (7.1ip, 7h, 1bb, 1r, 1er, 1k, 2.45era) had his second win. Boyer finished up 4-for-4 with seven RBI, Tresh 3-for-5 with four ribbies. In the National League home run leaderboard, Dusters occupied five of the ten top spots; the club as a whole had tallied 34 dingers in 19 games. In sharp contrast to the first game of the series, this one featured just one homer -- that off the bat of Cincy's Johnny Edwards to give the Reds a 3-1 lead in the 4th. But the Dusters strung together five consecutive singles for three runs to take the lead in the bottom of the inning. They tacked on three more in the 6th. But two hits and an error charged to Jerry Adair in the 7th had the bases filled with Reds for Pete Rose, who delivered a two-run single that cut the Nevada lead to 6-5, and they tied it in the 9th to send the game into extra innings. Pinch hitter Lou Johnson doubled in the Nevada 10th with just one out, but was left stranded. In the Cincy 11th Richie Ashburn reached second but was doubled off for the final out when Adair speared a Pete Rose line drive and stepped on the bag before Ashburn could get back. In the bottom of the 11th Cincy reliever Jim Brosnan walked Johnny Blanchard and Hector Lopez, Clete Boyer singled to load them up, and Blanchard scored the winning run on an Adair grounder. Vic Powe continued to sizzle at the plate, going 4-for-6, while Cam Carreon, spelling Blanchard as backstop, went 2-for-5 with a pair of runs. Starter Joe Horlen (4.0ip, 4h, 2bb, 3r, 3er, 2k, 4.50era) continued to struggle, while Bill Dailey got the win for a 3-0 mark. The Dusters were two games up on Cincinnati, Pittsburgh and St. Louis, all with 13-7 records. Ben Naylor continued to rest his regulars, starting Hector Lopez in the outfield in place of Lee Maye, and Gordy Coleman at first in lieu of Vic Power. "It's a long season," he explained, "and I'm more concerned about being in first place in September than in first right now." Starter Tony Cloninger was victimized for three runs on three hits in the Cincy 1st. A two-run homer by Billy Williams in the home 3rd made it 3-2 Reds. In the 4th, with two out and two on (thanks to a walk and a Cincy error), Ben Naylor decided to pinch hit for Cloninger, and Tony Oliva, recently called up from AAA Bakersfield, hit a high fly ball to center for the last out. "We weren't having much success against Maloney," said Nails, "so I figured we had to try to get a run or two right there." Williams doubled and scored on a Lopez single down the first base line to tie the game in the 5th. From that point on the bullpen -- Schultz, Brewer, Raymond and Dailey -- gave up just two more hits. The Reds relievers were stingy, too, but in the 11th, with two on and two out, Coleman singled in Adair and the Dusters had swept Cincinnati. Maury Wills went 3-for-6 with a run and a base theft, while Dailey (4-0), notched the win. BOS signed Hal Naragon (c), BOS signed Johnny Klippstein (p). HOU released Norm Larker (1b). LAD--Phil Ortega (p), wrist stress fracture, five weeks. BOS-- Carl Yastrzemski (lf), stretched knee ligament, four weeks. Jim O'Toole takes the mound for the Reds. In the middle of the third, Cincinnati leads 2 to 0. 1 run, 3 hits, 0 errors, and 3 left on base. At the end of the third, Nevada trails 2 to 1. In the middle of the fourth, Cincinnati leads 3 to 1. 3 runs, 5 hits, 0 errors, and 2 left on base. At the end of the fourth, Nevada leads 4 to 3. In the middle of the fifth, Cincinnati trails 4 to 3. At the end of the fifth, Nevada leads 4 to 3. In the middle of the sixth, Cincinnati trails 4 to 3. 2 runs, 3 hits, 0 errors, and 2 left on base. At the end of the sixth, Nevada leads 6 to 3. 2 runs, 2 hits, 1 error, and 2 left on base. In the middle of the seventh, Cincinnati trails 6 to 5. At the end of the seventh, Nevada leads 6 to 5. In the middle of the eighth, Cincinnati trails 6 to 5. At the end of the eighth, Nevada leads 6 to 5. In the middle of the ninth, the game is tied at 6. At the end of the ninth, the game is tied at 6. In the middle of the tenth, the game is tied at 6. The Reds guarded the lines. At the end of the tenth, the game is tied at 6. In the middle of the eleventh, the game is tied at 6.